Easy-to-use cloud dashboard with hidden depths. Very reasonable pricing too. Most data sources are supported by ClicData including Excel, CSV, databases (SQL Server, Oracle, MySQL and Access have direct connectors – others can be accessed via an ODBC driver), and cloud based services such as SalesForce, Twitter, Facebook, Basecamp and Google Analytics. Extract, transform and load (ETL) capabilities include calculated fields, SQL functions, joins over multiple databases and database versioning (up to 30 versions). 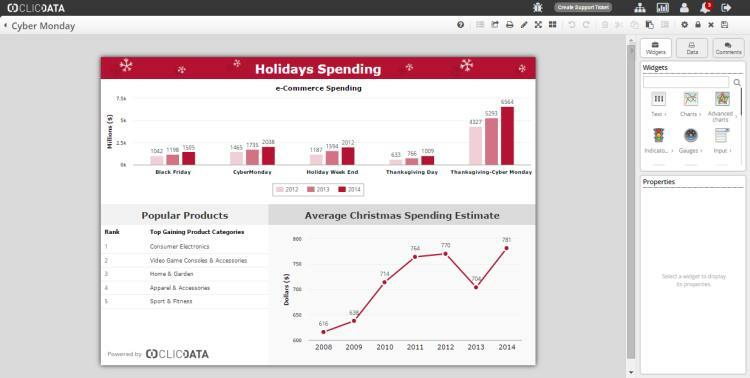 Dashboards can be created from templates or a blank. Users select a screen size and various widgets (charts, tables, inputs etc.) can be dragged onto the dashboard and refined as needed. Filters of almost any complexity can be created and modified on-the-fly. Powerful data functions allow date arithmetic, and several other categories of functions support arrays, logical, math and text manipulation – for more sophisticated users. A diverse collection of widgets mean dashboards can be configured with pleasing visuals and high levels of functionality. These include, charts, advanced charts (waterfall and radar), indicators (traffic lights, arrows, flags …), sliders, knobs, text boxes, tables (flat and pivot tables), maps (GPS and region maps) and numeric input fields. The functionality of widgets can be linked, and formatting can be made conditional on data values. Support for social sharing means colleagues can share a dashboard once their email address has been specified. Publishing of dashboards can be scheduled to groups of users, and dashboards can be exported as image and PDF and shared via a url, or via email. This aspect of ClicData is being enhanced because of its use in larger organisations, and a new user interface is being deployed to this end. This will facilitate the creation of teams and the ability to share dashboards with them. Dynamic filters mean that only the information that is relevant to a recipient is delivered on a dashboard. The good news for very small business and single users is the free version of ClicData. This essentially supports CSV and Excel data, and data refresh once a week. The Professional subscription comes in at just US$20 per month and supports other data sources and daily data refresh. The Enterprise package supports all data sources and automatic refresh down to a minute.This costs US$50 per month.